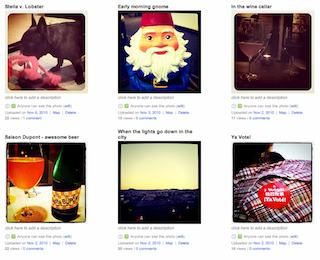 Flickr Should Have Built Instagram. But They Didn't. Here's Why. Back in June, we reported on the departure of Kellan Elliott-McCrea from Yahoo. While not hugely known outside the developer community, we had received several tips indicating just how important Elliott-McCrea was to the Flickr team, where his role as “Architect” was supposedly “vital” to the service. So who better to answer questions about Flickr than Elliott-McCrea (who is now the VP of Engineering for Etsy), right? And that’s exactly what he’s done on Quora. Specifically, someone asked the question: Why did Flickr miss the mobile photo opportunity that Instagram and picplz are pursuing? The mobile photo space is red-hot right now with several players beyond the two mentioned vying to become a common app on smartphones. And one of them, Instagram, was able to gain over a million users in less than three months. So why wasn’t Flickr, with all the resources of Yahoo behind them, able to dominate this space first? The simple answer, according to Elliot-McCrea, is “Innovator’s dilemma”. That is, if Flickr had wanted to create a successful service that leveraged Twitter’s social graph, they would have had to sacrifice their own login system for that of Twitter’s — which until more recently was considered very insecure. “The Yahoo! Paranoids would have shut us down in a heart beat,” Elliot-McCrea says. This is clearly a pain point for Elliot-McCrea as he was instrumental in creating the OAuth standard that Twitter and many other service now use to allow for third-party link-ups. So Flickr and Twitter linking up via OAuth should have happened right away, right? Nope. According to Elliot-McCrea, it took about two years — something which he detailed here. But even with that link-up in place, there were several other factors that stopped Flickr from creating an Instagram-like service or experience. “Additionally we fell into the trap of thinking like an incumbent, we spent 6 months off and on talking to Twitter about preferred product placement rather then just shipping the integration we had built,” Elliot-McCrea writes. “We also spent *years* debating whether or not to build iPhone apps/iPhone optimized sites or bet on a HTML5/multi-device strategy,” he continues. He also specifically calls out one Yahoo executive, Marco Boerries, as being particularly responsible for Yahoo’s lack of leadership in the mobile space. “Several Flickr internal attempts to build and ship native mobile experiences (going back to 2006) were squashed relentlessly. The Flickr iPhone app that eventually shipped was built by CL (Boerries “Connected Life” team),” Elliot-McCrea notes. That is very much in line with a story I heard a few years ago that Yahoo was “rushing” to get a native app done for Flickr to secure the hot iPhone photo-sharing space. Instead, they dragged their feet and it took another year or so to get it out there. So is this Yahoo’s failure? Another Quora answer by Flickr co-founder Stewart Butterfield sheds a bit of light on that. While the question asked isn’t directly related to the Flickr/Instagram idea, it is related to innovation at Flickr: Would Flickr have been more innovative since their acquisition if it had been Google that acquired them? “Impossible to know, but my instinct is that it would have made no difference. The problem at Yahoo! was being starved for resources and I’m pretty sure that would have happened at Google too,” Butterfield writes. Elliot-McCrea also cautions that it wasn’t entirely Yahoo’s fault for missing the opportunity — as most people did. He cites a service called Radar as one that was trying to do something similar to the current mobile photo-sharing craze but never caught on. I know Radar well, I glowingly wrote about the service back in January of 2009, and loved their yes — Flickr — integration a couple months later. But they did fail to catch on, and their parent, Tiny Pictures, was sold to Shutterfly for a small price later in 2009. And going forward: “It would actually be incredibly straightforward to build something like an Instagram on top of Flickr using the API, especially if you could convince Flickr to release an API to “Beehive” the friend finder tool, which among other things, benefits from Y! backdoor deal with Facebook,” Elliot-McCrea says. The problem now is that Yahoo seems much more interested in “sunsetting” services to reduce costs rather than actually building new things once again. And that really, really worries me with regard to Flickr. We’ve heard some unconfirmed whispers of outside parties interested in purchasing the photo-sharing service from Yahoo. Given some of the light Elliot-McCrea just shed on internal workings there, perhaps we can only hope there’s something to those rumors.